I like to make my own broth for many reasons. It tastes better, I can choose how to salt it, it’s environmentally friendly, and it doesn’t sit on a shelf in plastic for an indeterminate amount of time before it arrives in my soup pot. But, let me be honest, the biggest reason I make my own broth (or stock, maybe, if you want to get technical) is that it’s irresistibly cheap. Buying mostly organic produce is good for the environment and, I believe, for my family’s health. But the price tag still rankles a bit, especially here in Seattle where the only things that appear to grow effortlessly are rosemary and moss. Making my own broth allows me to essentially use my vegetables twice: I eat the trimmed part the first time around, and save the peelings for the stock pot. At $3.50 a quart, I’m saving over twenty dollars every time I make my own broth. If I do it once a month, the savings really add up over the course of a year. Of course, you might not eat as much soup as we do…but still. It makes me feel better about how much I pay for organic produce. The basic method is to chop your selected organic vegetable trimmings into 1-2” pieces and save them in a bag in your freezer. (I wouldn’t do this with non-organic vegetables, because I’d be concerned about concentrating the pesticides that are in the peels. This is my completely unscientific personal opinion.) Add to the bag over time. When it’s full, put everything in a pot, cover it with water, add some seasonings, and simmer for 30-45 minutes. Add salt until it tastes like something you’d like to drink by the mug. Strain and use your broth, or freeze it for later use. Get a new freezer bag of trimmings started and repeat. The only mental effort required is the contemplation of whether the trimmings you have before you will taste good in your broth. Some are easy: Carrots? Yes. Broccoli rabe? Probably not. Turnips? Trick question! They’re great. You want to aim for a balance of flavors in your stock pot. For me, the essentials are onion, celery, and carrots (or another sweet vegetable, like winter squash). If I don’t have some of each in my frozen mix, I will sacrifice a whole onion or a few stalks of celery to balance out the flavors. Beyond, that, though, the sky’s the limit. I have tried to list some of my favorites (and a few un-favorites) below, but if you want an opinion from me and/or your fellow readers about whether a particular vegetable would be good in a broth, please just ask in the comments. One more note: this process has the added benefit of giving you seasonally-flavored broths. The vegetables I’m cooking this month are going into the freezer, and what goes into the freezer ends up in the stock, which means that my stocks reflect current seasonal flavors. Perfect, because my soups usually do as well. It’s a beautiful cycle. When cooking in the summer, I usually do want a light broth with corn and tomato flavors, and in winter I am glad to have a rich one full of mushrooms, root vegetables, and winter squash. And finally: After making this list, I went to consult my vegetable bible, Deborah Madison’s Vegetarian Cooking for Everyone, and I saw that she has a similar but much more detailed list of vegetables that she recommends using and/or avoiding. And our lists are not the same. So experiment! And, as always, consider your own tastebuds as you curate your frozen vegetable scrap collection. This entry was posted in DIY, My Favorite Recipes, Soups, Vegan or Would-Be-Just-As-Good-Vegan and tagged cooking, DIY, family, homemade, kids, lifestyle, organic, recipes, soup, vegan, vegetarian on April 7, 2012 by emmycooks. Yes, yes, yes! The freezer stockpile is my absolute favorite cooking trick. Perfect broth for the unbeatable price of $0! I don’t use kale leaves (or other brassicas) in my broth, but I do use kale stems–they don’t seem to produce the same off effect for some reason. I’d also like to warn against using dill stems, as they will give your broth the unmistakable tang of pickle brine. TRUE about the dill. I will add a general warning above about using strong flavorings of any sort. And thank you for the kale stem tip! I always compost mine but would love to use them first instead. I also sometimes see them thinly sliced in kale salads, which I also haven’t tried but should. I might actually…. TRY this. We go through a lot of broth when it’s soup season and even the veg. bouillion cubes seem kind of pricy. What do you make in the summer with veg broth? It doesn’t feel like soup weather to me (but we’re not in Seattle!). What if I put it on Pinterest, then will you try it? ;-) I do still make soup in summer: radish top soup! Carrot top soup! Corn chowder! But then again, we ARE in Seattle. Awesome!! My only problem is fighting with my husband over what gets the trimmings: the soup pot or the compost pile! You can still throw the veggies on the compost pile after you’ve extracted the flacors for your stock: win-win! I recently started making my own broth at home and love it! Your post was very helpful for filling in the gaps (I can never figure out just how much salt to add). And I love the idea of using parmesan rinds…I’ve got some in the fridge that I’ll definitely throw into my next pot! Isn’t it a little addictive? I don’t think I’d ever buy boxed broth now (although I do use the occasional Rapunzel bouillon cube). Also, I think a lot of people don’t salt their stock at all when they make it and then just do it to taste for each dish as they use it up. You’ll love it with those Parmesan rinds! Thanks a ton. Looks like I’ll have to add an intermediary step between cutting and compost blending. So that would be THREE uses of a single vegetable, right? Awesome. Ethical question: I keep a chicken bone and vegetable scrap bag in my freezer from which I make stock. When I use the stock, should I tell my guests that I gnawed at the bones that made the broth? It’s boiled. That means sanitized to me. Any opinions? Don’t tell them. Some people are irrational about hygiene. I know people who won’t wear 2nd hand clothes, being washed or not makes no difference… Ignorance is bliss! Add red beetles to my stock and mum’s the word. Got it. Thanks Emmy! I agree mostly with your list of things to use/not to use, except that I never add anything from the cabbage family. Fennel and asparagus do not have a ‘neutral’ taste, so I do use them but only in stock for a dish that will have fennel or asparagus in it. In winter I usually add one or two pieces of dried porcini mushrooms for more flavor. AND I forgot to tell you that I roasted a head of cauliflower the other day and steamed half first so I could taste them side by side. The steamed florets were more tender and the un-steamed a bit chewier (I think that’s what you said you thought too). Now that I know the difference, I will probably consider what texture I want in my finished dish next time I’m roasting cauliflower! Thanks for inspiring me to experiment! You’re very welcome, great experiment! You could also influence the texture by using smaller/larger pieces of cauliflower. I didn’t really know what to expect when I started blogging a few months ago, but it certainly has been both fun and interesting to interact and share ideas with other knowledgeable bloggers like yourself! Emmy, this is a wonderful idea, and one that has completely escaped me even after all these years in the kitchen! Of course I have made broth from various bones … chicken, beef, turkey … but I’ve never saved my vegetable peelings. I do compost, though. What a great way to get full value from the produce we buy or grow. And, I think I’d be able to compost the veggie trimmings once the stock is done, since there’s no fat added to it. What a wonderful lesson in intentional living … from now on I will give everything a good rinse or scrub before peeling. Stop #1 for the trimmings will be the stock bag in the freezer, and stop #2 will be the composter. I love the idea of seasonal broths! I can’t believe that it never occurred to me before, but it makes so much sense. Thanks, Emmy! 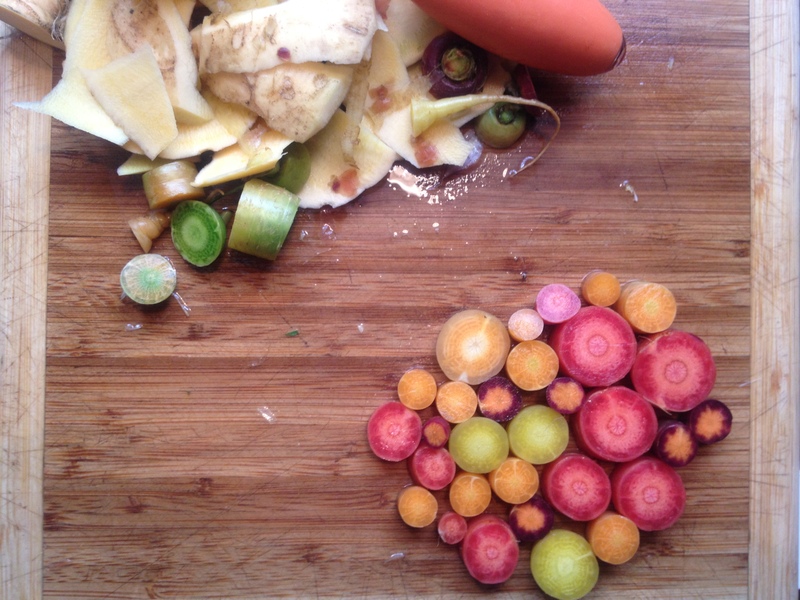 BTW, I am loving the photo of the carrots and the vegetable trimmings on the cutting board. So pretty! Hi. Just wanted to let you know how much I enjoy your blog! I nominated you today for the Versatile Blogger Award. Check out my post for the details. Thanks for sharing your thoughts and ideas! Thank you so much, what a nice compliment! And can I just say how impressed I am that you read a fiction book a week? I wish I could say that! What a great post! I can’t wait to start my own freezer bag. We do this with chickens and sometimes rabbits (that is, throw the bones in the freezer for later stock-making). Must get in the habit of doing it with veg, too. Especially those things like root veg peelings and ends that the chickens won’t eat. Nice post! Thanks! I should add that I see the stockpot as in intermediate step between the peeling process and the chickens, since mine are quite happy to eat the cooked veggies after I’ve made stock. Pingback: Toddler-Friendly Vegetable Chicken “Magic” Soup | Laura's "Rules"
Thanks so much for this wonderfully thorough and creative post. 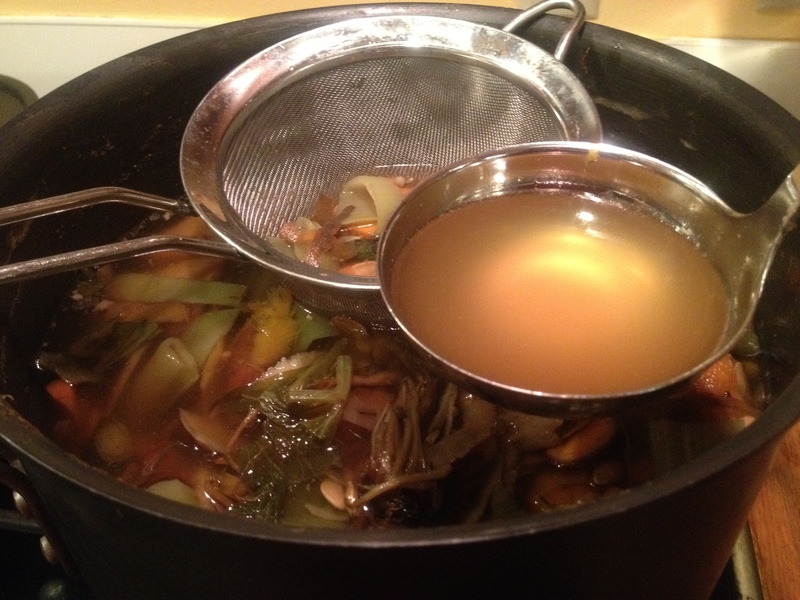 I just recently (like in the past week) discovered that one can make delicious vegetable stock from scraps. So I blogged about it. Then, in response, a friend mentioned freezing scraps. And from there I found you, with this wealth of information. Just in time for serious soup season. Thank you!